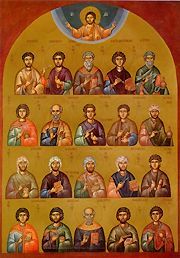 These Saints were from Asia (that is, Asia Minor). After the death of their father, their Christ-loving mother Theodota reared them in piety and in all manner of virtue, and had them instructed in every science, especially that of medicine. This became their vocation, and they went about healing every illness and malady, bestowing healing freely on both men and beasts alike; because of this, they are called "Unmercenaries." And thus, having completed the course of their life, they reposed in peace. O glorious, wonderworking physicians, having received the grace of healing, you reach out and restore health to those in need. But also, by your visitation you cast down the arrogance of the enemy, healing the world through miracles. Share the feast of Cosmas and Damian the Holy Unmercenaries of Asia, and their mother Theodota with an icon greeting ecard.